Mr. Yoon (age 70) is furious that his (ex) son-in-law, Daniel (Job: Dentist in Seoul), has recently divorced his only daughter. Mr. Yoon is fully intent on “getting back” at Daniel. How dare he. So in order to thoroughly ruin Daniel’s career/reputation, Mr. Yoon starts making/spreading false accusations online saying that Daniel is facing multiple charges of massive tax evasion + that his whole “dental clinic business” is a pyramid scheme, etc… With these accusations, Mr. Yoon also circulates multiple pictures of Daniel’s dental clinic and Daniel too. Mr. Yoon goes about doing this anywhere/everywhere he can online (e.g., blogs, forums…). He even employs the help of Mr. Lee (age 28), telling him to write posts/emails confirming the false claims. Mr. Lee obliges. When Mr. Yoon and Mr. Lee’s online accounts are banned, they somehow obtain 30+ unused accounts to keep on going. This goes on for more than 2 months. Finally, Daniel files a criminal complaint against both Mr. Yoon and Mr. Lee. Both are indicted and found guilty. What type(s) of punishment can Mr. Yoon and Mr. Lee expect under Korean law? The Seoul Central District Court found both Mr. Yoon and Mr. Lee guilty of the crimes of “Cyber Defamation” (사이버 명예훼손), “Interference with Business” (업무방해), etc. 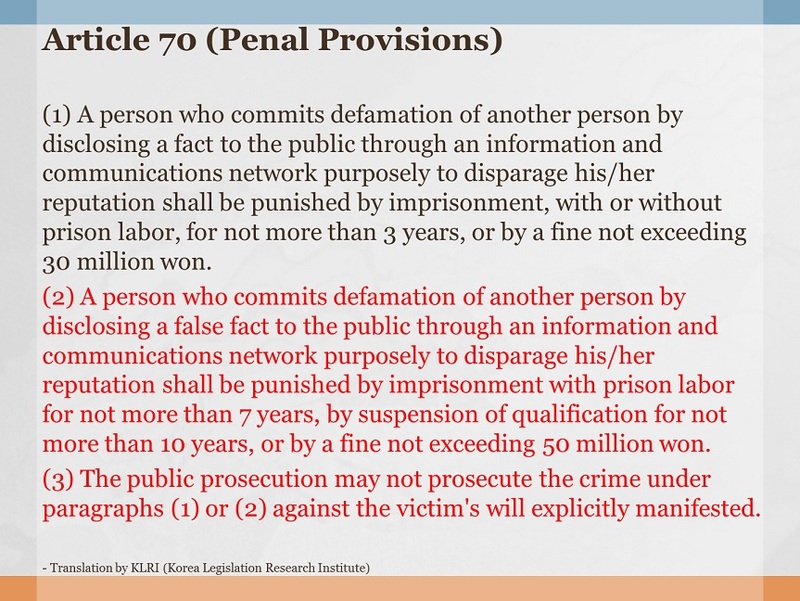 In Korea, when defamation is perpetrated online (i.e., “Cyber Defamation”), the Act on Promotion of Information and Communications Network Utilization and Information Protection, etc. (정보통신망이용촉진및정보보호등에관한법률) is applied first, in place of the Criminal Act (형법). (In such case, the Criminal Act serves as a “backup.”) Please see the slide at the top of this post. Articles 70(2) and 70(3) apply to this particular case. 1) Mr. Yoon was sentenced to 10 months in prison. No probation. This means he will actually serve time in jail. Behind bars! 2) Mr. Lee was sentenced to 4 months in prison (2 years probation). This means he will not actually serve time in jail. 1) Why is Mr. Yoon going to jail? Basically, the gravity of the lies and the systematic/egregious manner in which they were spread (e.g., using other people’s accounts…). + That the lies affected the public at large too. By disseminating false information. + Finally, no “settlement” was reached with the victim. FYI, if a “settlement” is reached with the victim, the perpetrator is unlikely to be criminally punished. See Article 70(3) above. 2) Why is Mr. Lee not going to jail? Mr. Lee acted at the behest of Mr. Yoon. 1) Defamation is a crime (not just a civil matter). In Korea, defamation is both a criminal and civil matter. Defamation is a crime, and the victim can also sue the perpetrator. So here, Daniel could also sue Mr. Yoon and Mr. Lee. A person found guilty of a defamation crime is most times punished by a (criminal) fine of a few hundred million won. A prison sentence (and actual prison time on top of that) is still somewhat rare. But not impossible, as we have seen here.